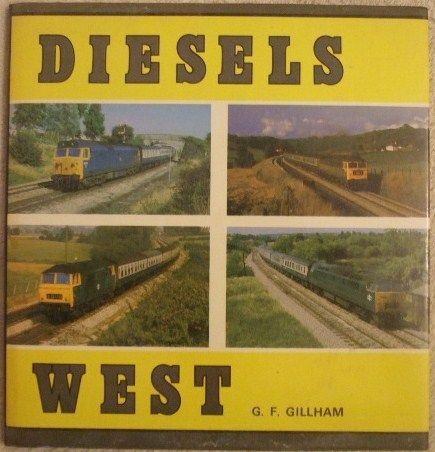 First edition, first print hardback of DIESELS WEST, by Geoffrey F. Gillham and published by D. Bradford Barton Ltd., Cornwall in 1979. The book is in very good condition (Clean blue cloth boards with gilt lettering on spine), with only slight wear to the dust jacket which is not price clipped (minor creasing to the edges). Internally, the pages are clean and tight and there are no tears and no inscriptions. There is light tanning to the pages. "In 1972, the Western Region inter-city scene was still much as it had been for years, the only change on the motive-power side being the withdrawal of most of the diesel-hydraulic classes and their replacement by a smaller number of diesel-electrics transferred from other regions. Twenty-year-old Mk. 1 coaching stock was still in use on many main line trains, which were themselves running to timetables scarcely improved since the introduction of diesel traction twelve years before. The photographs in this book have been chosen to illustrate the changes that have been taking place on the routes to the West during the years 1972 - 78, and show many scenes already gone - as well as those due to vanish over the next few years." 94 pages. Illustrated with black & white photographs throughout.